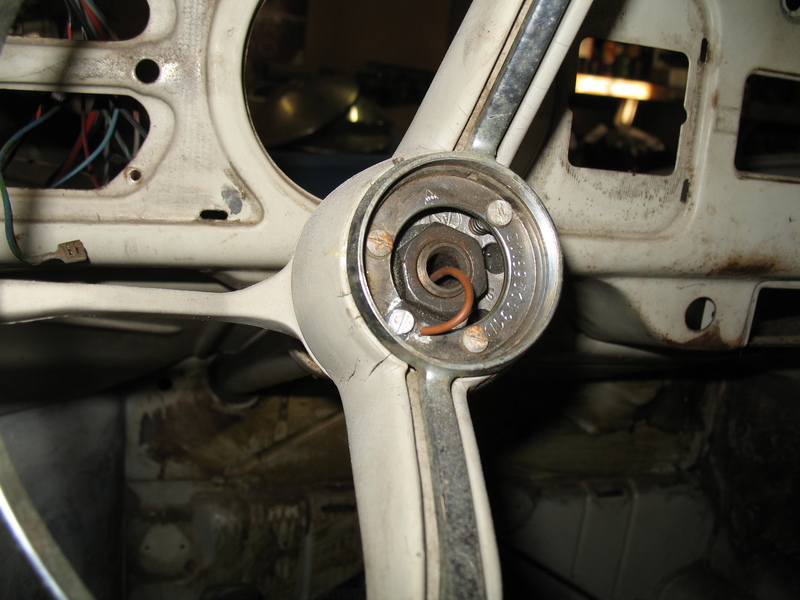 Removed the horn button on the steering wheel (it snaps in place), then removed the semi-circular horn switch (three spring-loaded screws). 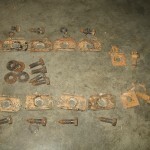 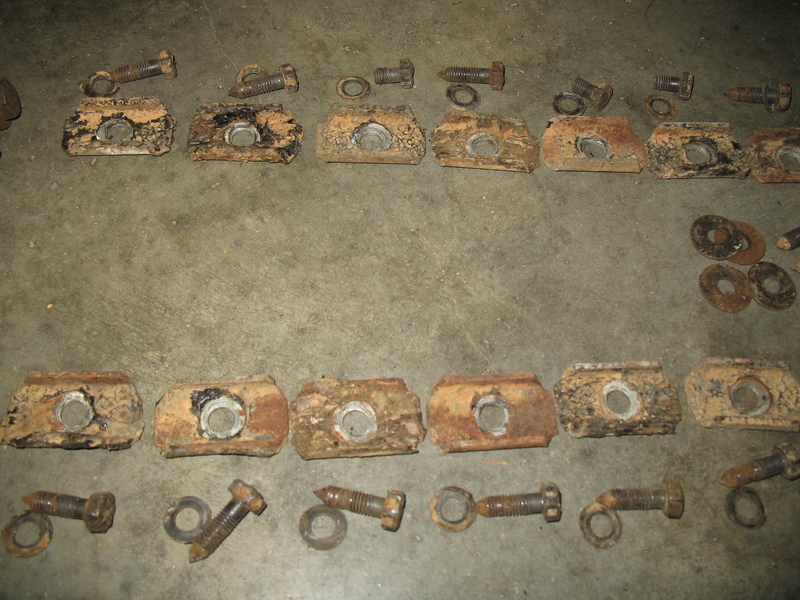 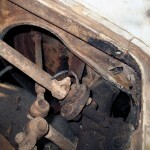 Also began taking off the chassis plates and screws that hold the body to the floor. 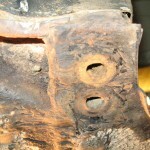 Lots of crud underneath the body, and sometimes the screws break rather than come out. 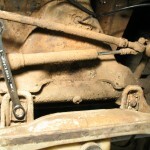 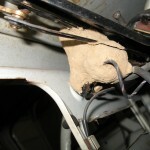 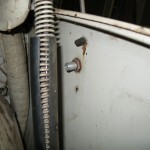 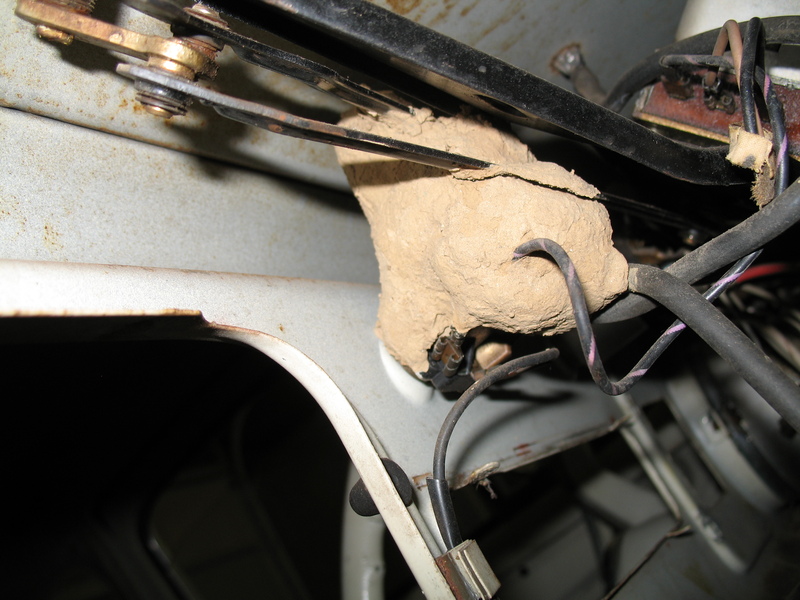 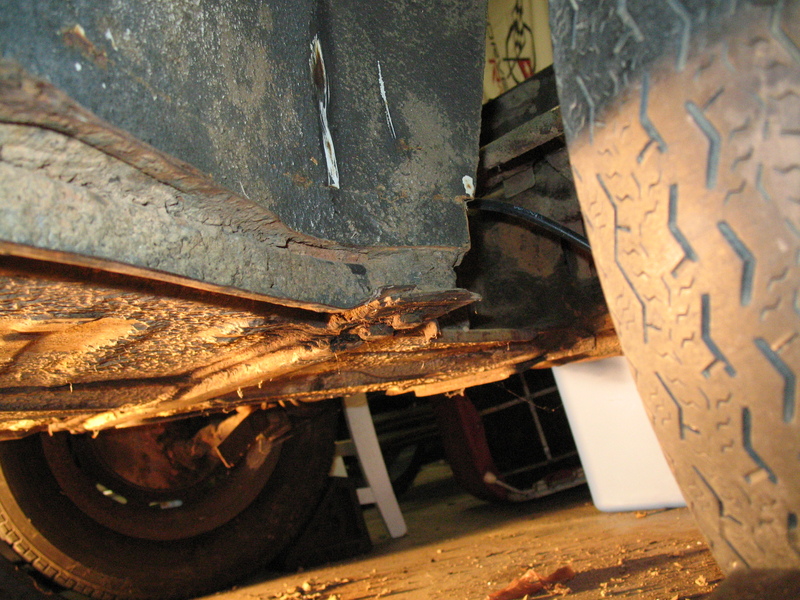 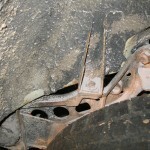 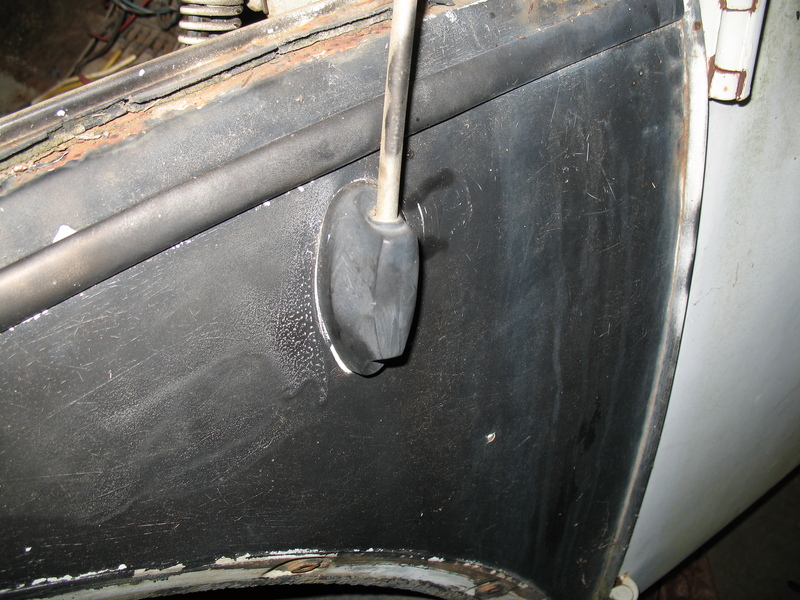 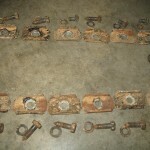 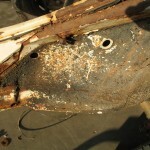 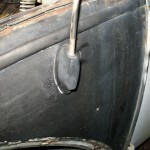 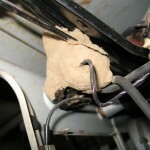 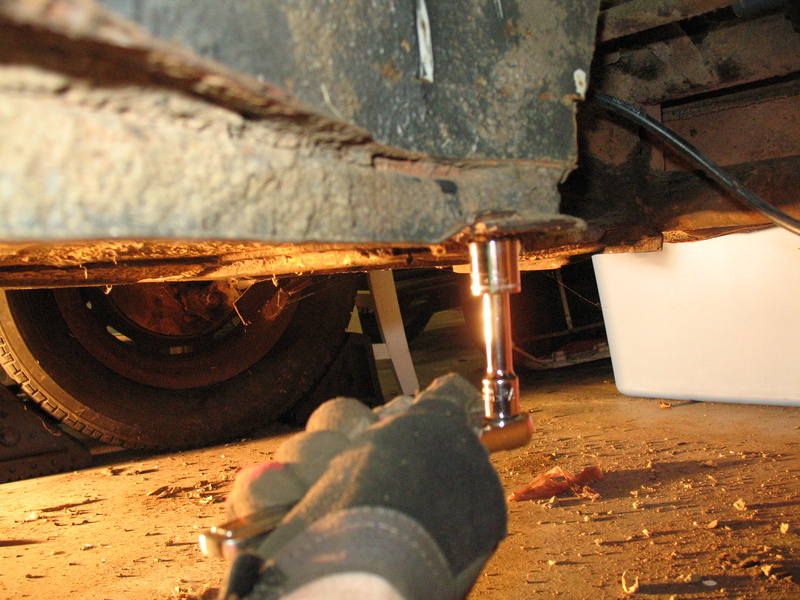 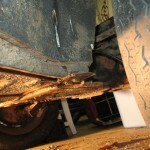 They can be hard to get to without jacking up the car, since they are just about at the lowest point on the body. 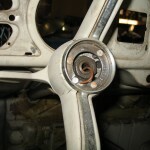 Steering wheel with center button removed. 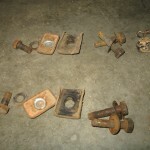 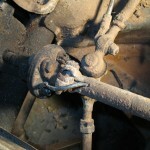 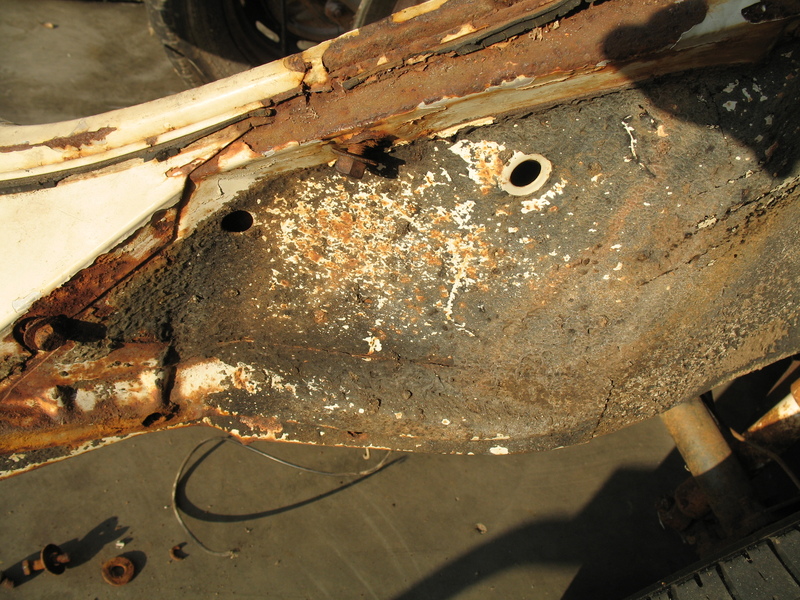 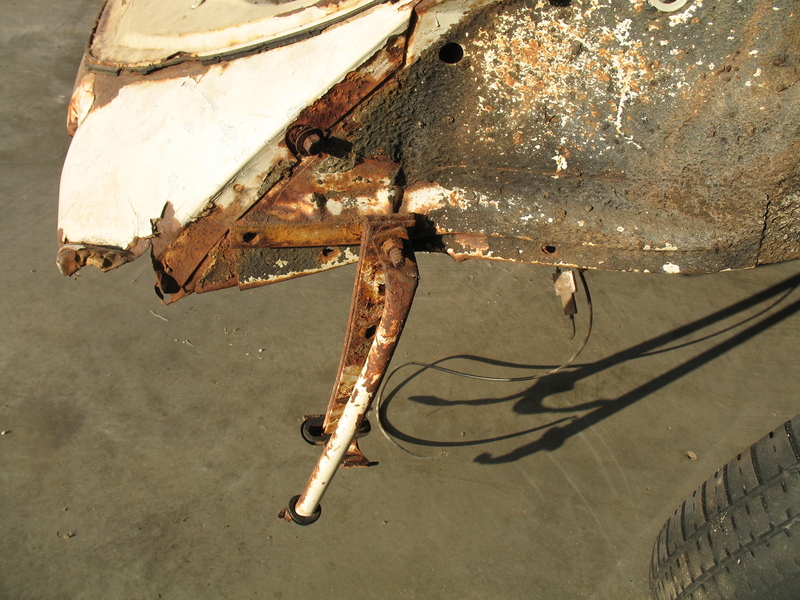 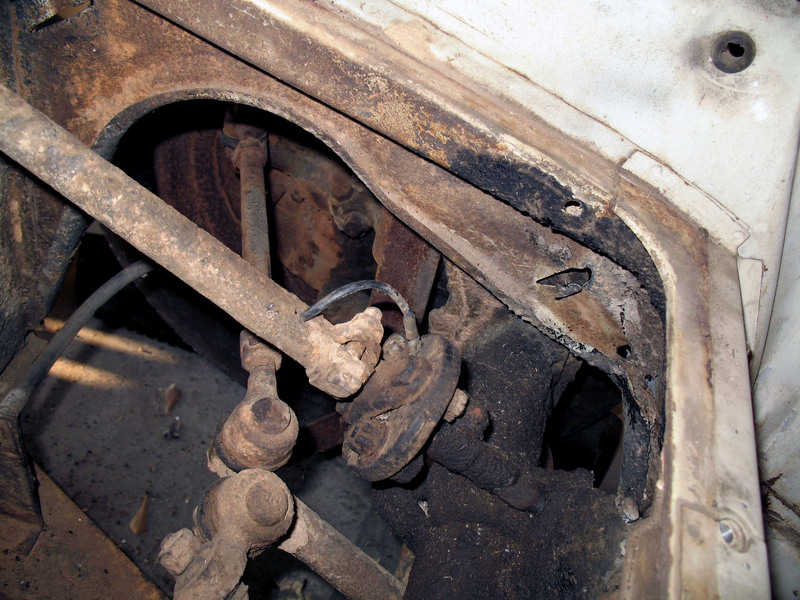 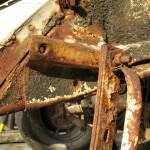 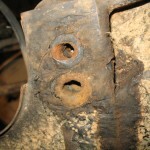 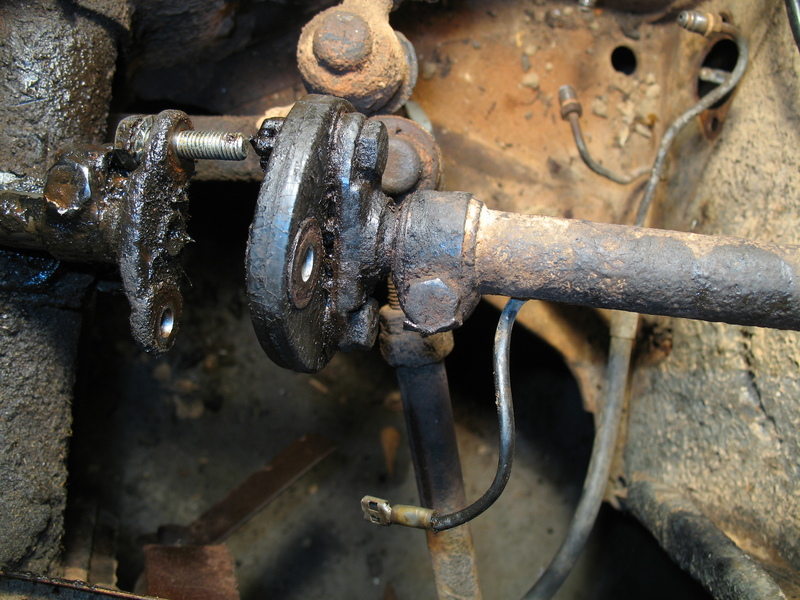 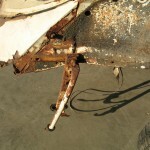 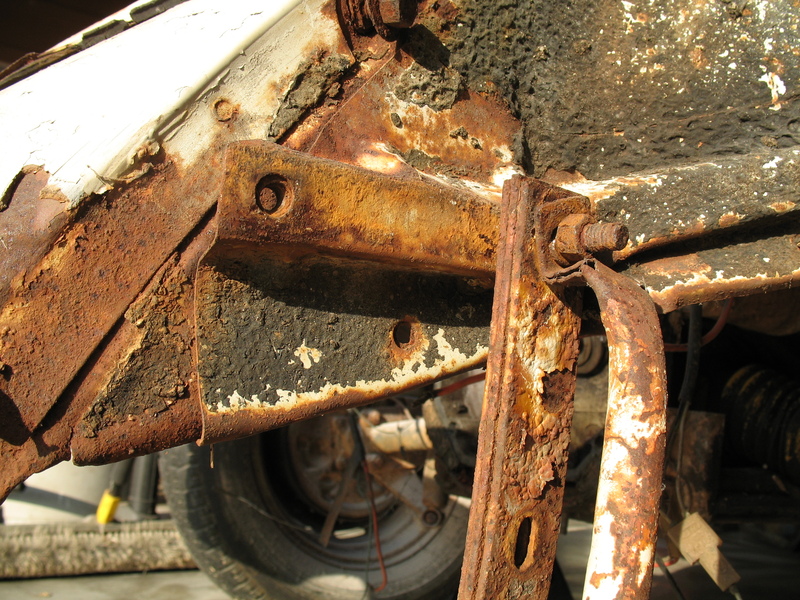 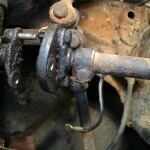 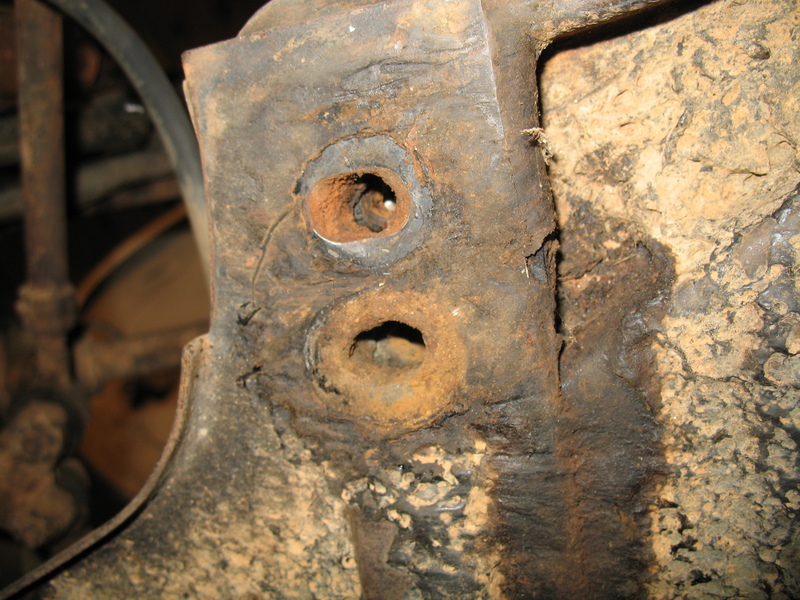 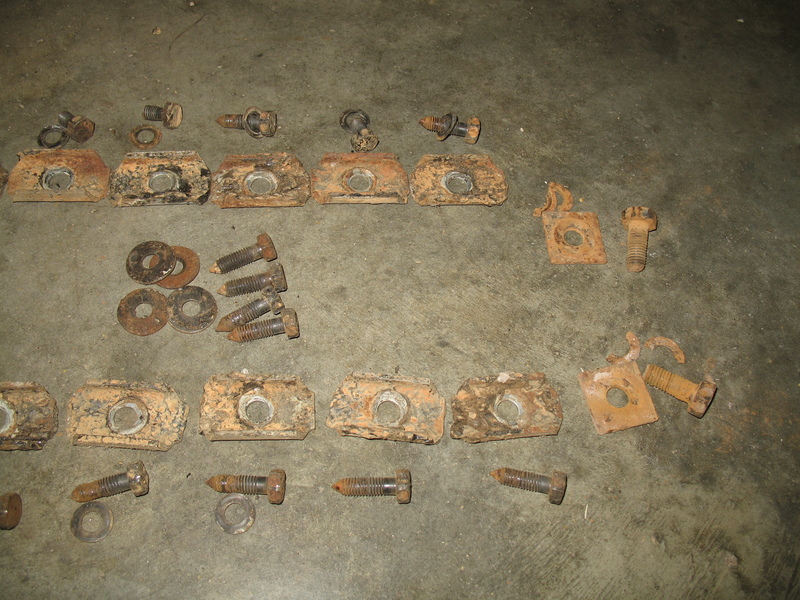 The rear bumper bracket has a nut and bolt to rusty to remove. 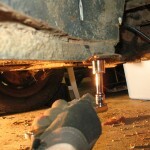 Cut-off tool to the rescue. 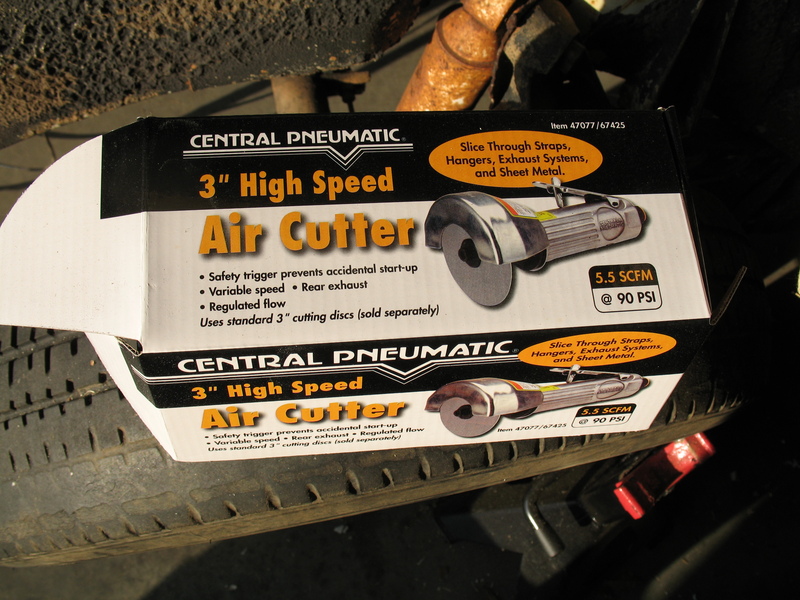 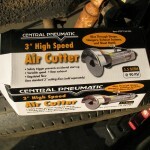 Purchased from Harbor Freight on sale for about $7.00, and cut-off discs (pack of 10) from there, also. 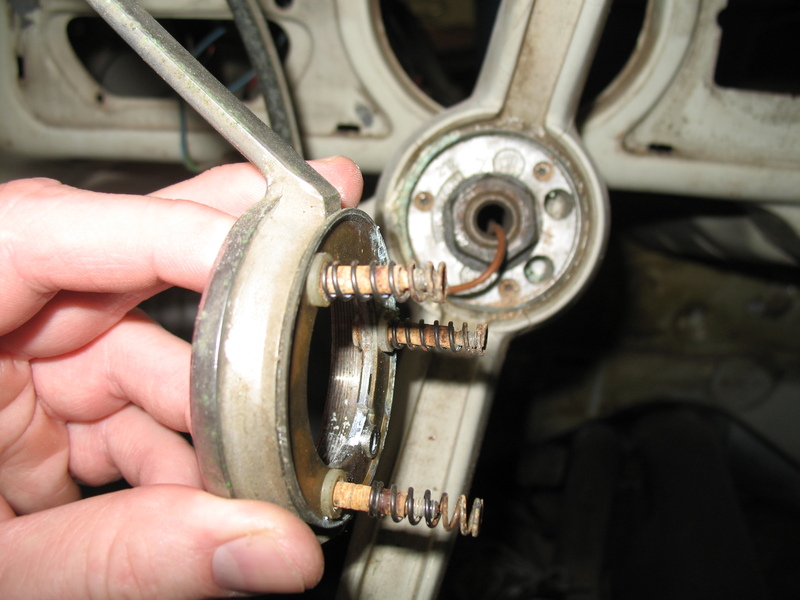 Be sure to wear safety goggles. 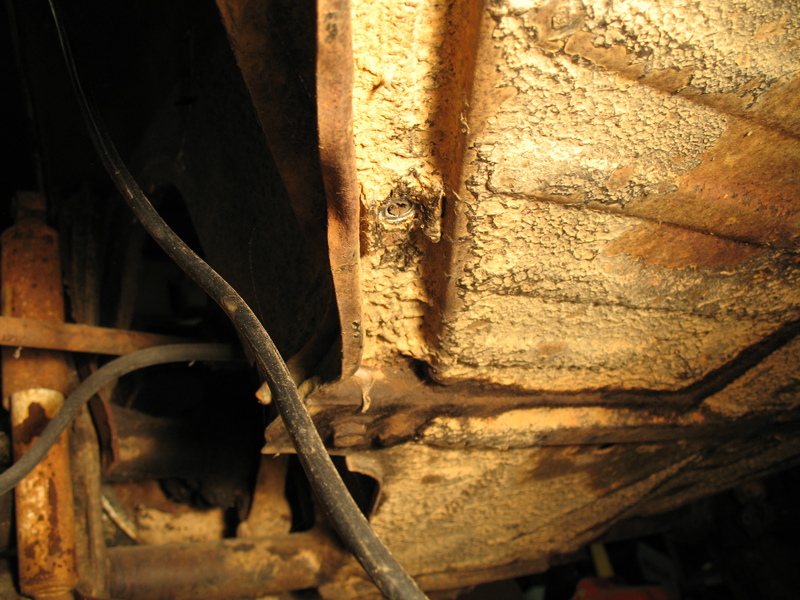 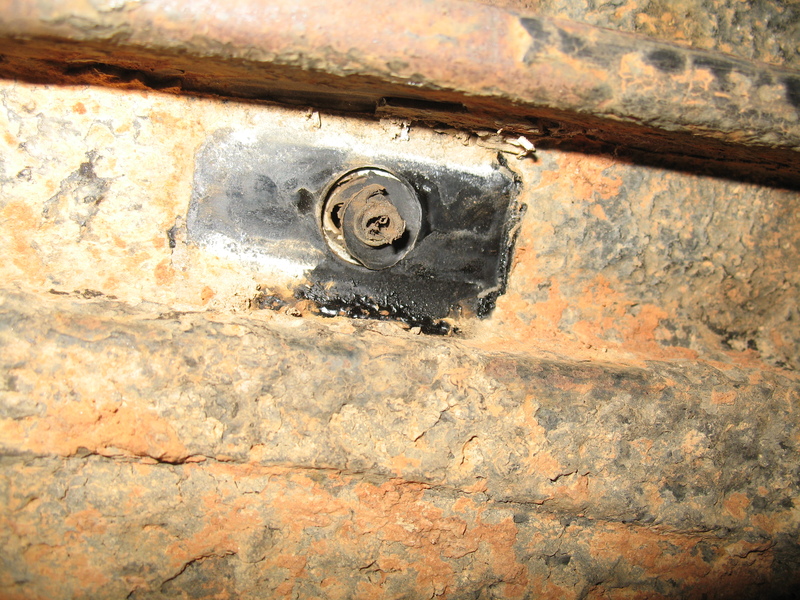 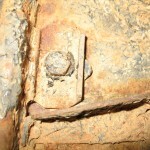 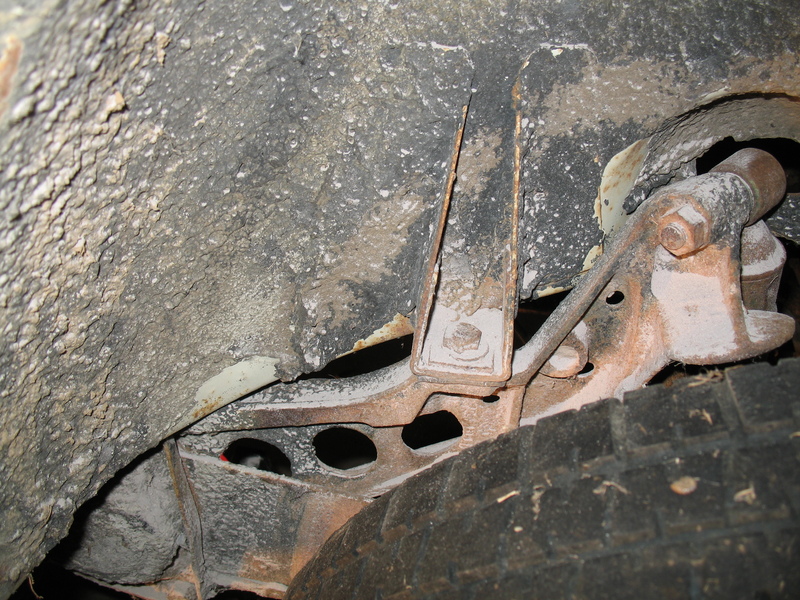 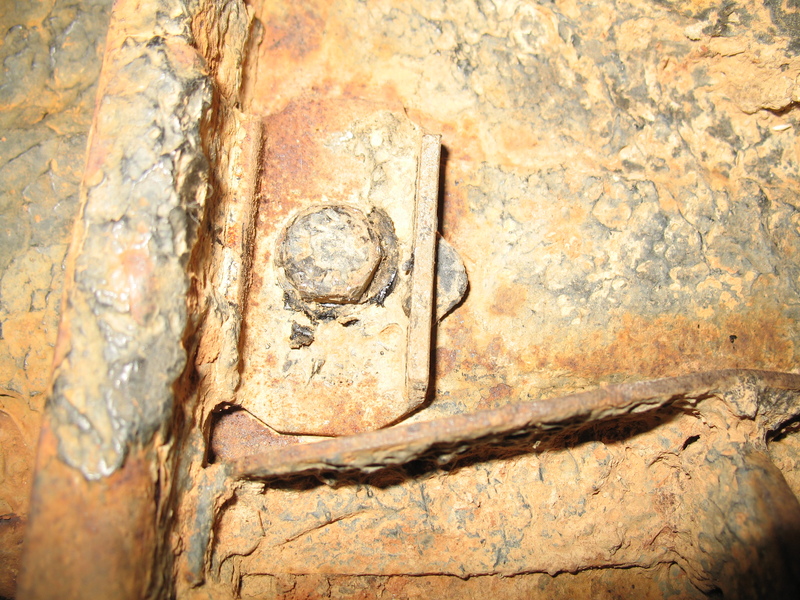 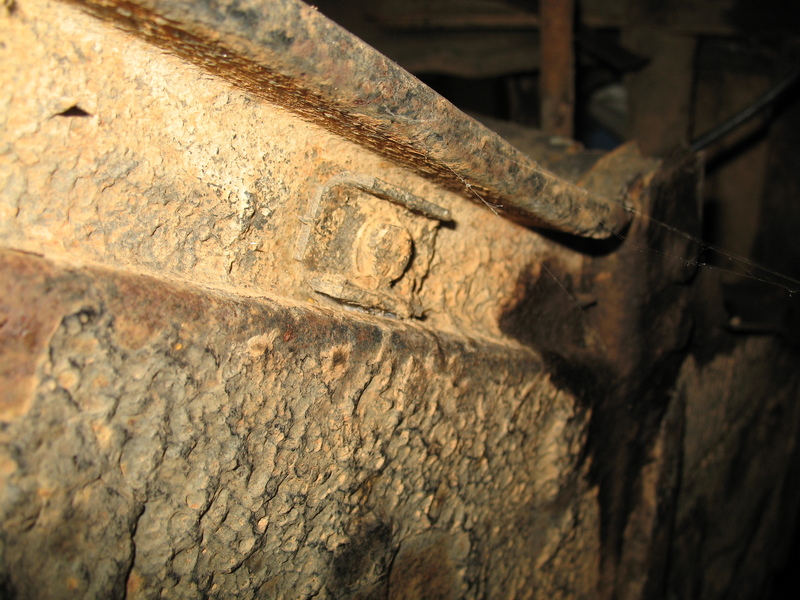 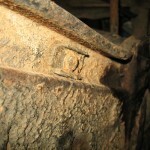 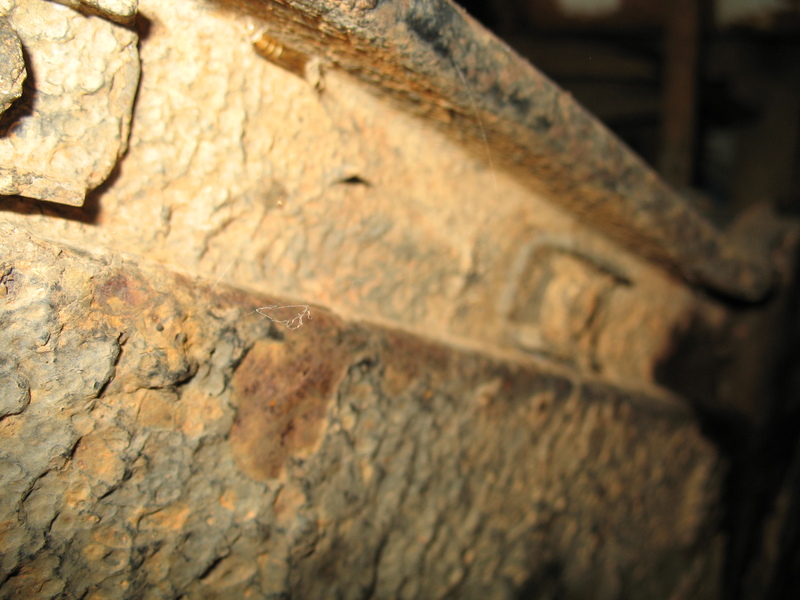 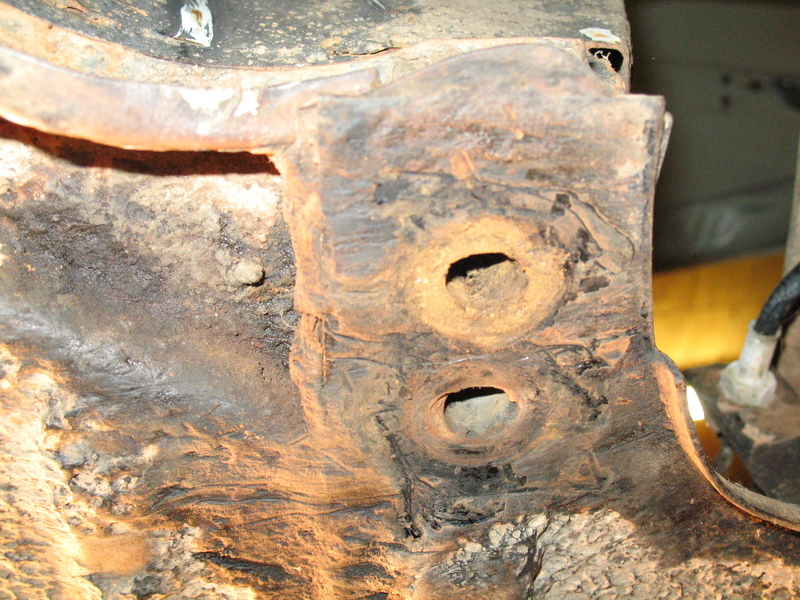 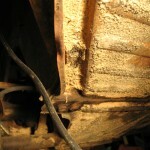 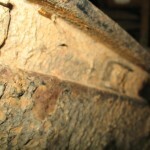 Rusted nut and bolt on the rear bumper support. 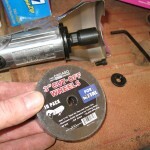 Cut-off discs. 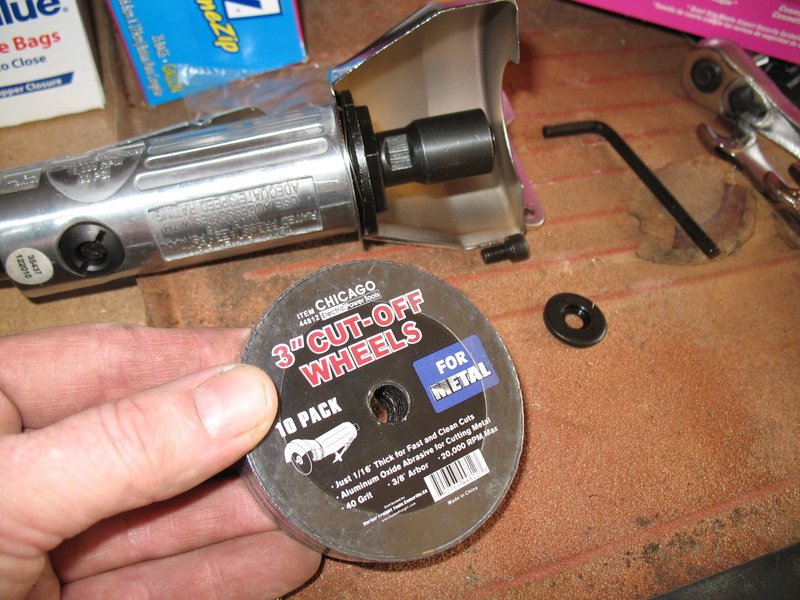 These cut-off discs are “FOR METAL”, ergo they won’t cut flesh? 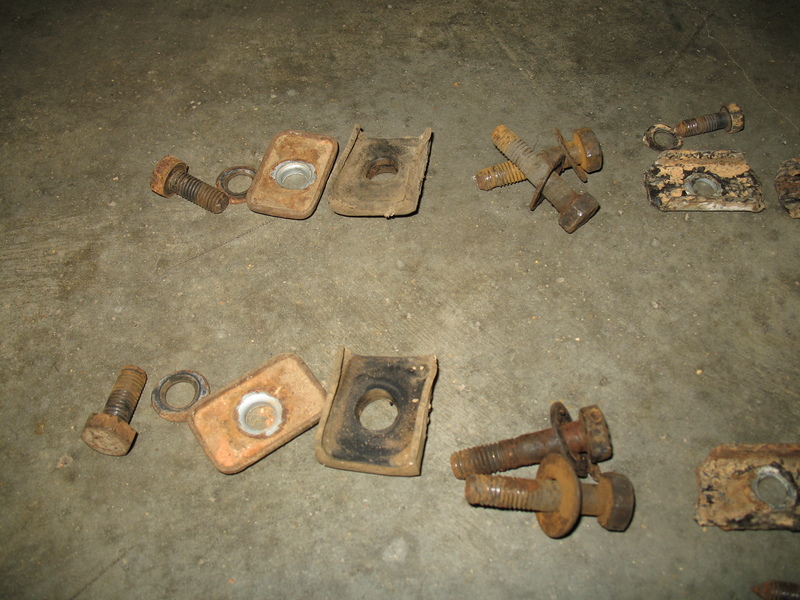 I feel lucky. 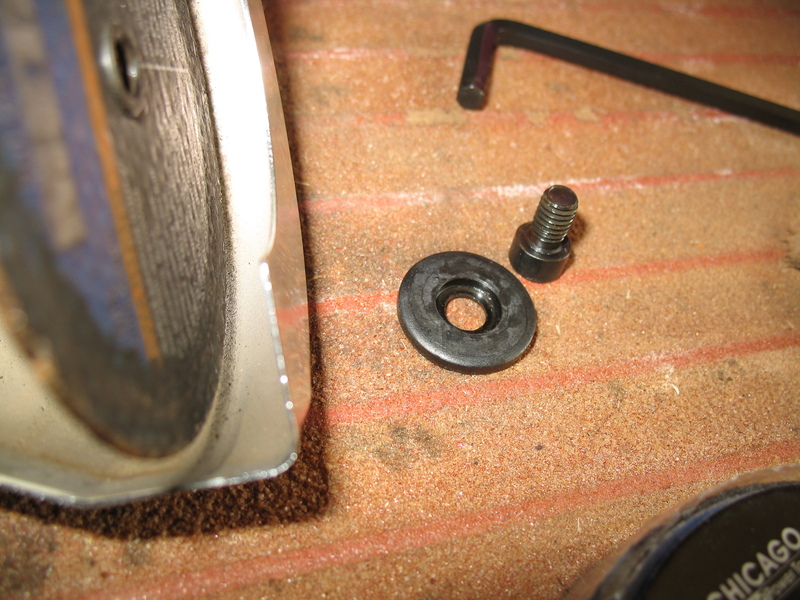 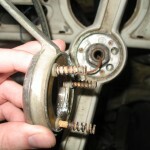 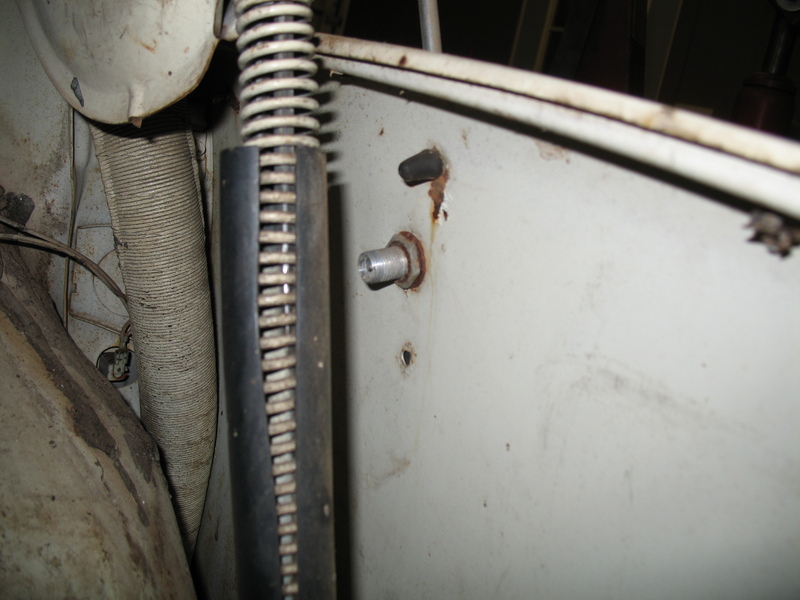 Cut-off Disc retaining washer and screw. 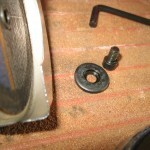 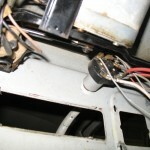 Make sure the retaining washer has the indention facing the cut-off wheel and arbor shaft. 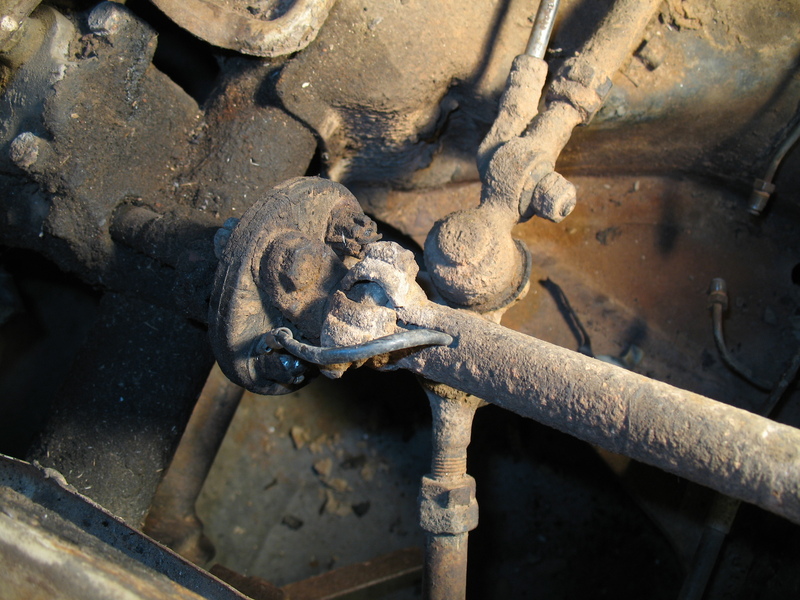 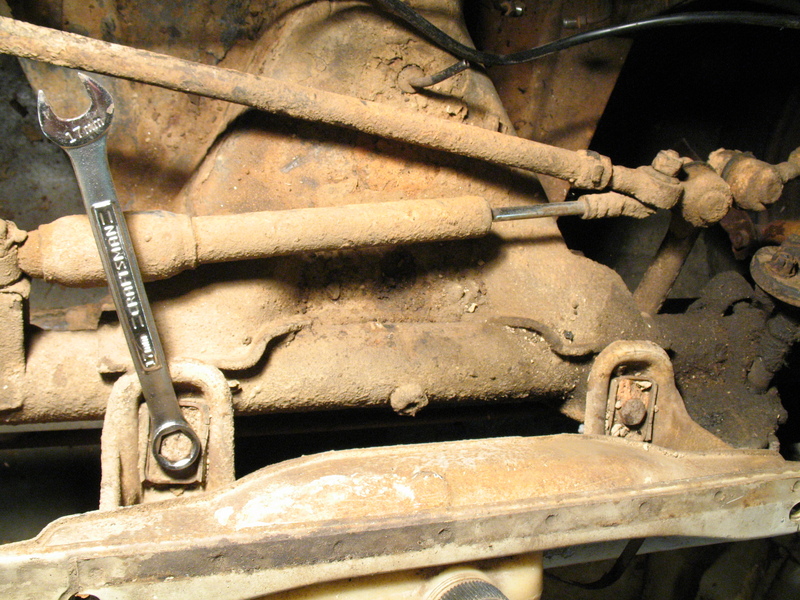 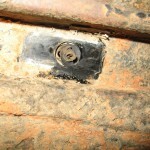 Bolt has been removed, and rests harmlessly on the ground. 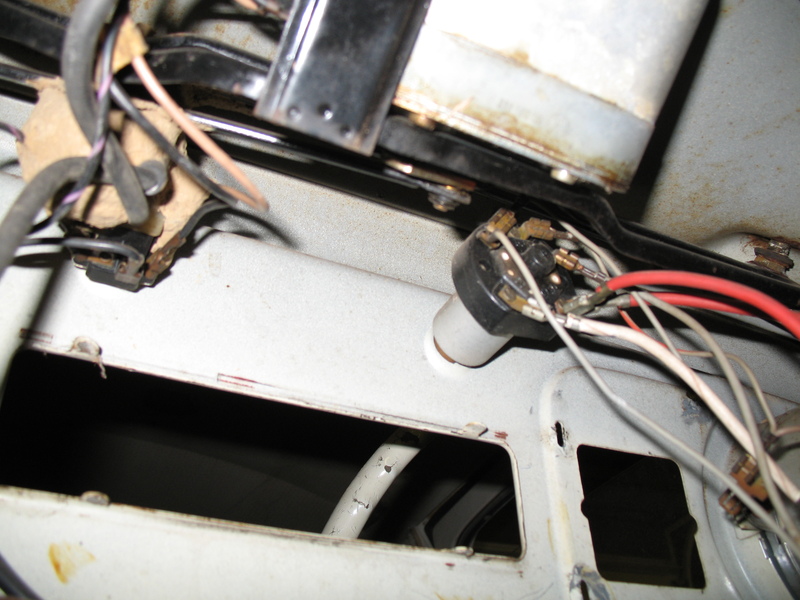 Removal of antenna, windshield wiper motor, and electronics. 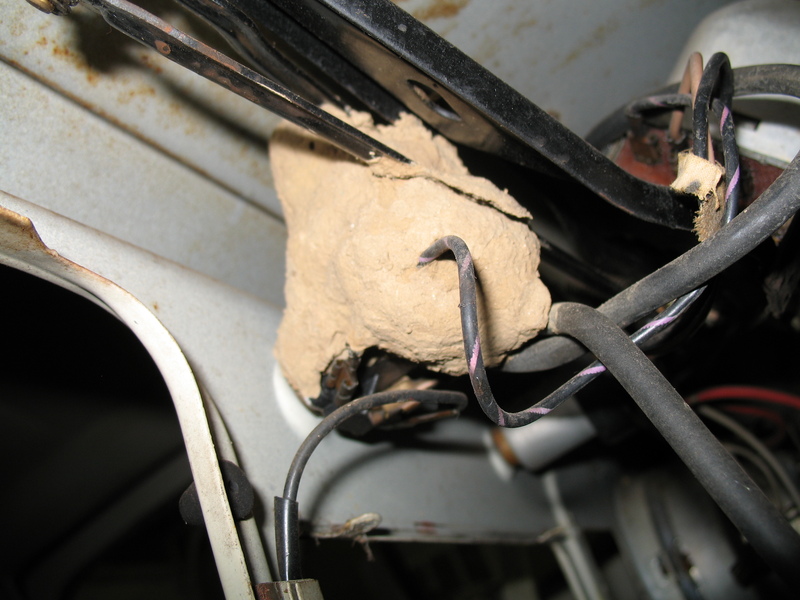 Found a huge bug nest wrapped around the windshield wiper switch.